When you try to earn money online, you will stumble upon ClixSense for sure. It is one of the oldest and most established PTC (pay-to-click) websites out there. The initial idea is simple: you click on an advertisement, look at it for a few seconds and you are rewarded with money. Don´t laugh, it actually works as a business model and results are quick. The idea was then expanded to include Surveys and small Offers/Tasks you have to complete online. In addition, ClixSense sports an enticing referral program. Follow my link and start earning with ClixSense. 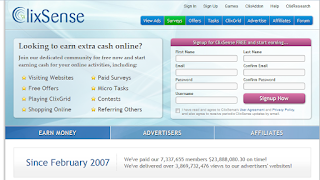 ClixSense is active since the year 2007. In the short-lived online world this can be considered "ancient". The business model is viable and the forum community is quite active. ClixSense is not a scam. Good to know, since you have to be very careful when surfing the web for websites that promise you quick money. It is important to know that the activities at ClixSense where you earn money are provided by third parties. So just because ClixSense is safe, you shouldn´t abandon common sense and click on everything you see within the advertisements. You will find a broad range of jobs on ClixSense. I will explain them briefly in this chapter. As an beginner, you can expect to earn approx. 2$ per hour. The more you get familiar with ClixSense, the better you can finish the jobs and earn money more efficiently. I want to provide you with realistic excpectations, the income is in no way high enough to quit your daily job. This is your ClixSense bar which contains all the available jobs. First you choose an advertisement from the View Ads tab that you want to watch. Then you have to solve a captcha, something like finding the picture of a cat in a bunch of dog photos. The intention here is to confirm that you are a human being and not a bot that is doing the work for you. After approximately 20 seconds you can close the ad and the money is instantly transferred to your ClixSense account. The money earned usually ranges between 0.1 and 1 Cent. A slight variation of this principle is the ClixGrid. It is more like a lottery. You watch the ad and afterwards you are notified if you won something from the prize pool. You can win up to 10 $ but as you can imagine, the chances are astronomically slim. Surveys are the most lucrative job on ClixSense. Between 20 Cent and 4 $ is the usual fare. Most of these surveys center around consumer behaviour. For example, you are presented with a list of different brands like Coca Cola and you have to tell which feelings you connect with the brand. Before you can start taking surveys, you have to complete a profile first. The goal here is to filter out surveys where you are not the target audience. Because there are lots of surveys. And sometimes for a very specific fraction of people. So completing the profile will reduce the chance of being kicked out of a survey because you are not the kind of person the survey initiator was looking for. It still happens frequently. But don´t get discouraged, completing a survey and getting a substantial amount of money transferred to your account is a very uplifting feeling. Offers and Tasks are small jobs with lots of variety, too much to go into detail here. There are simple offers like "watch an advertisement video on YouTube" and the more questionable things like "install some kind of software on your PC". I have no problem with the first one, but the second one I really don´t like. Installing foreign software is always risky. The money that can be earned here is below the Surveys but way above View Ads. The potential for passive income is huge. As a member of ClixSense you can place links and banners and every new member that registers via your links will be part of your downline. 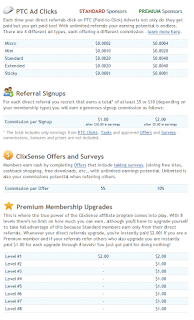 Every time your affiliates earn money at ClixSense, you earn a small provision. Of course, this doesn´t reduce the income of people in your downline, that´s a given for any good referral program. Unfortunately, you can only earn from your direct referrals. There is a possibility to profit from 8 levels deep, but it involves paid premium accounts and is generally more complicated than neccessary. To keep you coming back, ClixSense features a neat little system. Every day you are provided with an arrangement of objectives, summarized in your Daily Checklist. Completing the checklist will earn you a percentage-based bonus on your earnings on that day. Do it three days in a row and the bonus increases even further. Consistent efforts are therefore rewarded well. The Daily Checklist. As you can see, I have still lots of things to do today. Watching advertisements is not exactly an activity that uses lots of brainpower. You can easily finish them while concentrating on something different. How ironic is it that you can bridge commercial breaks when watching TV with watching advertisements on ClixSense and get paid for? Surveys, on the other hand, take considerable more effort. You have to focus on the questions because there are test questions scattered across the surveys. Get distracted, answer incorrectly, and you are kicked out of the survey. As you can see, there is a lot of getting kicked out involved. Even when you answer truthfully. This will eventually lead to frustration. But it is also a very uplifting feeling when you complete a survey and your account balance makes a big jump upwards. Completing surveys is lucrative, watching ads not so much. The referral program gives you lifetime-provisions for all your referrals. It is a bit too complicated. 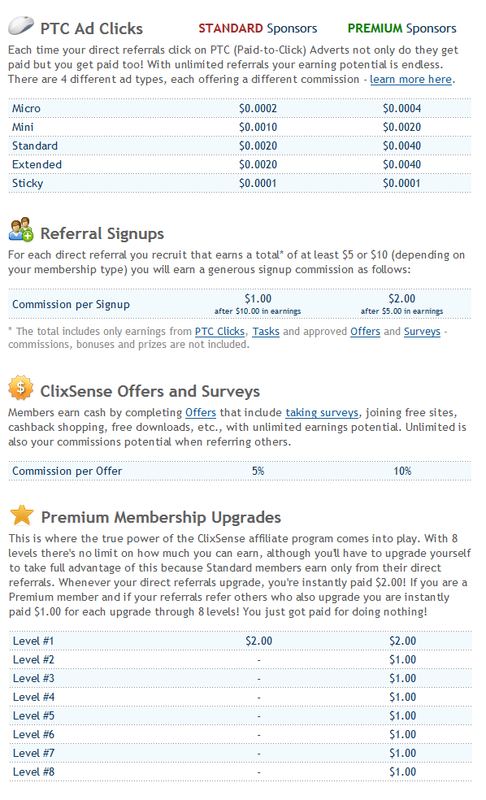 ClixSense is an established PTC site. It is safe but be still cautious with the content provided by third parties. The Daily Checklist Bonus provides a nice incentive. Getting kicked out of too many surveys can lead to frustration, though. 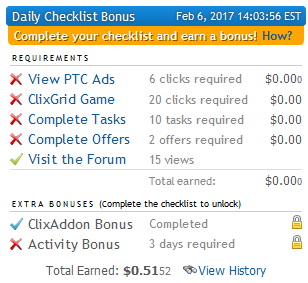 So this wraps up my experiences with ClixSense, an ideal starter if you are interested in PTC. If I could interest you in earning money via ClixSense, I would be glad if you use my link to join ClixSense. You will be part of my network and you can contact me anytime if you need further advice on how to use ClixSense.